Flying Fokker Triplanes In Wwi Or F-16S In The Gulf? Chris Brace Looks At The Expanding World Of Flight Simulators. Murray Kirkus Visits Gilligan's Island. 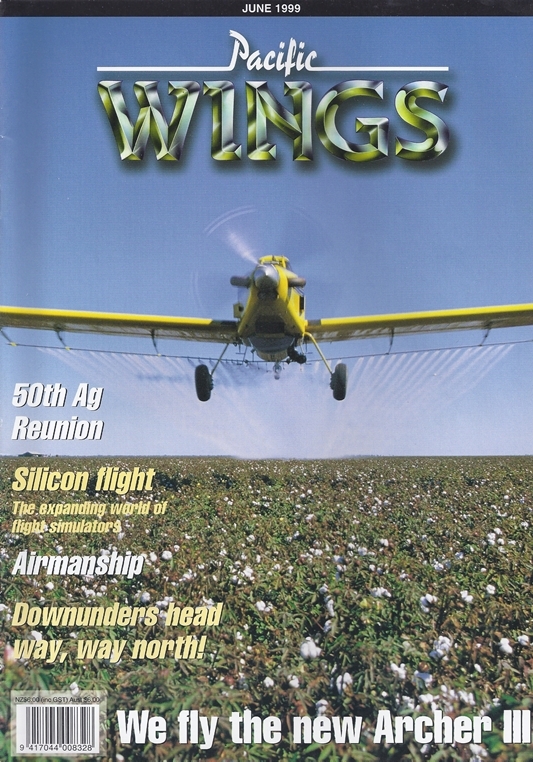 A Selection Of Australiaan Correspondent Neville Dawson's Airtractor Photographs. Brian Souter Flies The New Piper Archer IIi. Did He Like It? You Betcha! Downunders Head Way, Way North! Want To Know How To Stop A Siksiit Nibbling Through A Dgps Antenna Cable When You'Re Trying To Look For Gold 25 Metres Above The Ground? Brain Haybettle Tells All. Technical Director Of Aviation Theory Centre, Stewart Boys On Good Airmanship - The Holy Grail Of Flight Safety. A Snapshot Look At The 50Th Ag Reunion. Margaret Richardson Writes Of Lakeland Helicopters And Their Venerable Workhorse The Huey. Denis Monti Positions Rex Aviation's Jetstream 32, Zk-Rey, Alongside The Sport Vintage Aviation Society's Harvard, NZ1033 (Zk-Sgq), Being Flown By The Ceo Of Rex Aviation. John Lanham. Peter Clark Photograph.